Honours in Law is a special commendation that appears on your University degree and academic record. Rather than ‘B.Laws’ after your name, your degree is listed as ‘B.Laws(Hons)’. It is a distinguishing feature that stays with you for life. Unlike other courses, Honours in Law does not require an extra year of study – Honours takes the place of two alternate units in your final year of study (‘embedded’ Honours rather than ‘end-on’ Honours). Enrollment in Honours is by application only. What work does Honours involve? Honours is a year-long unit. You attend fortnightly seminars, during which you receive advanced training on research, argument and writing. You also meet regularly with a supervisor, who is a member of the Law School academic staff and helps you develop your thesis. Ultimately, you submit a thesis of between 10,000 and 12,000 words at the end of the year on a topic of legal significance, which is then marked by two independent examiners. There are also assessments during the year that assist with the thesis – a detailed research proposal, an oral presentation of your proposal, a literature review and an oral presentation of your final thesis. These assessments are marked on a pass/fail basis. 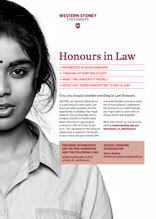 If you are interested in Honours in Law, then you should see whether you are eligible to apply. You need to show the likelihood of having a Honours Weighted Average Mark (HWAM) of at least 70 at the time of graduation. If you might be eligible, then you need to consider a research topic and a possible supervisor. You can write to an academic staff member directly to arrange a consultation or you can write to the Law Honours Program Coordinator (lawhonours@westernsydney.edu.au), who can make suggestions on possible supervisors. Once you’ve met with a possible supervisor and they seem interested, then you can submit an application via the online application form (see right margin). Applications for Honours in 2020 need to be submitted by mid-February 2020.